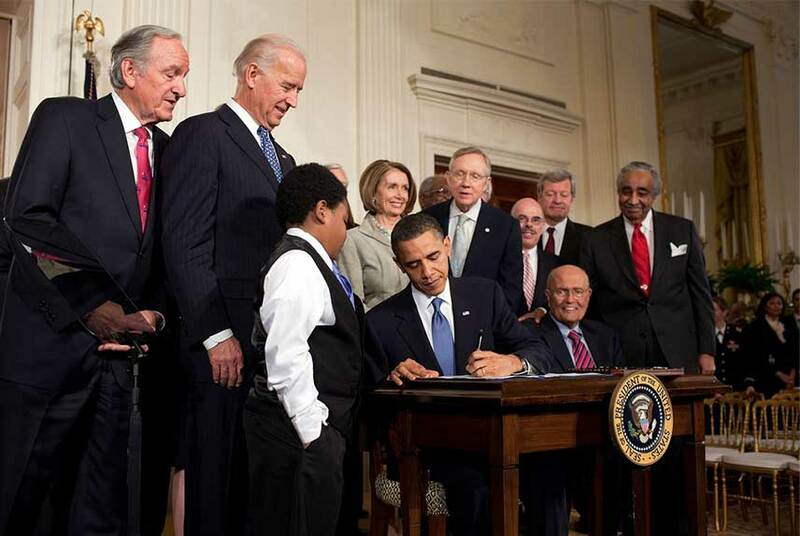 On March 20, 2010, President Obama signed into law the Patient Protection and Affordable Care Act. Also known as ACA. It was the most extensive overhaul and expansion of the medical system since 1965. Since the time of President Truman, it had been the goal of the Democrats to expand medical coverage for all Americans. In 1965 Medicaid and Medicare were passed that provided medical care for the poor and the elderly. Bill Clinton proposed a major health care reform bill. It failed to pass. In 1997 however, Clinton negotiated with Congress to pass the State Children’s Health Insurance Program. When President Obama was elected, he decided to make the passage of a health care bill his second most important priority. The first stopping the free fall of the American economy. A bill was debated in both the US House and the Senate. In the Senate, the Democrats were able to pass the bill 60-39 on December 24, 2009. Soon after passage, the Democrats lost one seat in Senate after Senator Kennedy’s death and the subsequent election of a Republican to fill the set and thus lost their ability to pass anything that could overcome a Republican filibuster. As a result, the House decided to pass the exact bill that had been adopted by the Senate. Changes could come later as part of the budget reconciliation process that could not be filibustered. On March 21 the House of Representatives passed the bill by 219-212. President Obama signed the Patient Protection and Affordable Care Act on March 23, 2010. The significant provisions of the bill were a guarantee the insurance companies could not deny coverage due to a preexisting condition. Premiums had to be the same for people of the same age. A base level of insurance had to be provided to everyone that was insured. A cap on out of pocket expenses was created. Annual and lifetime caps were banned. Preventive care such as vaccines could not have a copay. Children could remain on parents plans till they turn 26. Everyone was required to buy insurance or pay a fine- this was known as the individual mandate, and was designed to ensure people did not wait until they were sick to get coverage. Insurance markets were set up in states to created new pools of coverage. The government subsidized the cost of insurance to the middle class. © 1996-2019 Historycentral. All Rights Reserved.